jonchoo: Discovery Channel "Alone in the Wild"
Discovery Channel "Alone in the Wild"
Yesterday I attended the press launch of a new Discovery Channel series Alone in the Wild at the swish One Marylebone London, a venue that serves great canapes I should add. The six-part series will follow eight celebrities surviving in the wild. Sounds familiar? Well it should - this is the sort of reality TV isn't new. Except it sort of is. With Alone in the Wild, each participants are left completely alone. 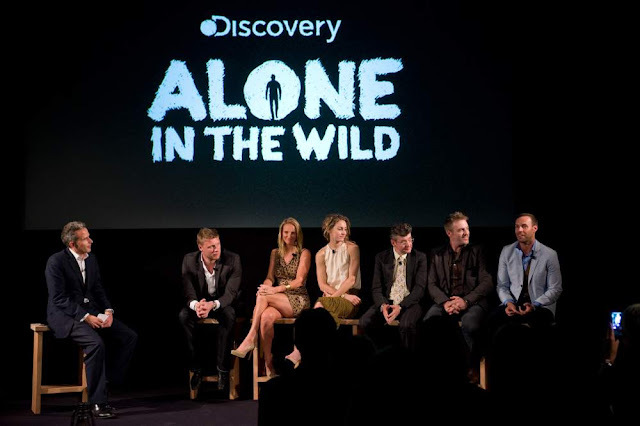 And when Discovery Channel meant alone, they don't mean fake alone like the Bear Grylls's Man vs Wild series where he often misleads viewers into thinking he is alone stranded on an island when in fact he has a whole camera crew with him and retires to a 'basecamp' every so often. No, in Alone in the Wild, Discovery Channel stresses that each of the personalities were left completely alone with their own camera equipments to film themselves. Episode 1: Andrew 'Freddie' Flintoff, the former captain to England's Cricket team, who was left alone in Botswana. Here he encountered a herd of elephants and received a nocurnal visit that terrified him. Episode 2: Jason Gardiner, judge of Dancing on Ice and Strictly Dance Fever, was also left to fend on for himself on Belize for six nights. No luck catching fishes, he almost gave up after three days but a rainbow soon changed his mind. Episode 3: Comedian Joe Pasquale, who is no stranger to the wild. He was winner of I'm A Celebrity... Get Me Out Of Here after all. In this series, Joe was sent to a wet Guyana where he lost three toenails and vowed not to kill anything with a face. Episode 4: Amy Williams, the first British Winter Olympics individual gold medalist in 30 years, was paired up with Tanya Streeter, a world record holder in free diving (at a depth of 160 metres), were also sent to Botswana where they spent three days in separate camps. Episode 5: Two tough guys were paired up at Guyana. Donal Macintyre, an investigagive journalists, and Chris Ryan, a retired SAS who once walked nearly 200 miles to escape Iraq in 1991. One had a lucky escape from a tree. Episode 6: Aron Ralston, a mountain climber and the subject of Danny Boyle's well received 127 Hours film. In 2003 Aron was forced to amputate his right arm with a dull knife in order to free himself from a boulder. He was left marooned on Belize, a deserted island, for... you guessed it - 127 hours. Homesick, he starts to dwell on the 127 hours he spent trapped in Utah and even began to talk to coconuts. I don't know about you, but I am really looking forward to watching Aron Ralston doing his best Tom Hank's impression. Finally, here is a sneak preview to the series. Many thanks to David for the invite.